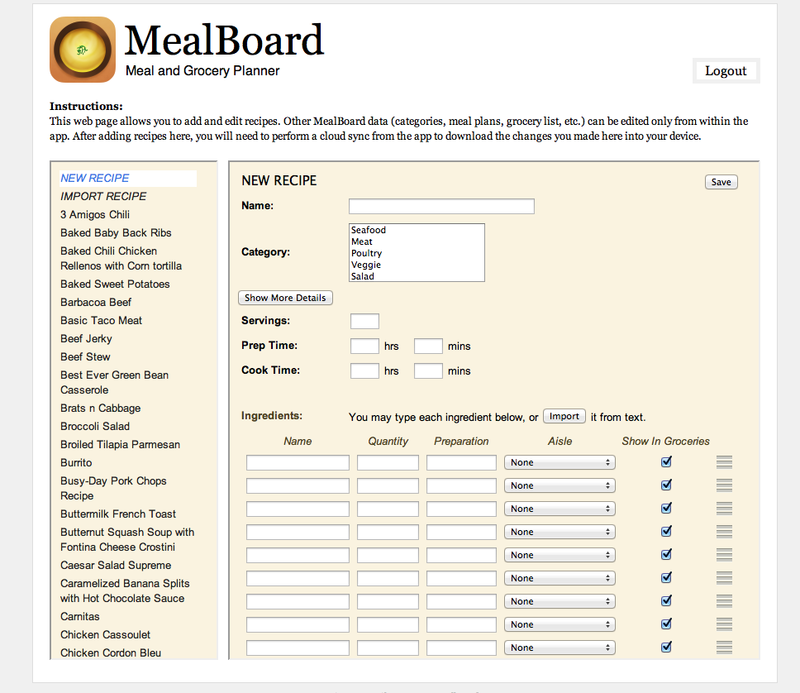 MealBoard: Meal Planning, Grocery Shopping and Recipe Organization Sanity - in one App! 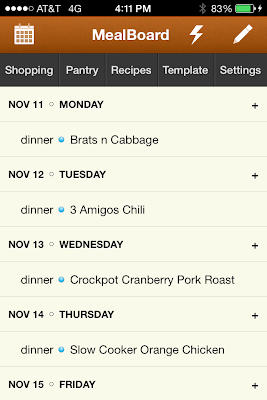 Home » MealBoard: Meal Planning, Grocery Shopping and Recipe Organization Sanity – in one App! 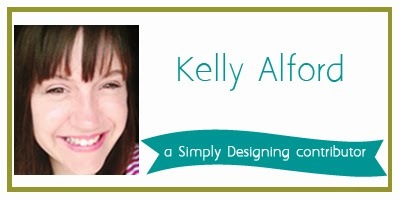 Hi, it’s me, Kelly, with another “Geek Mom Approved App”! 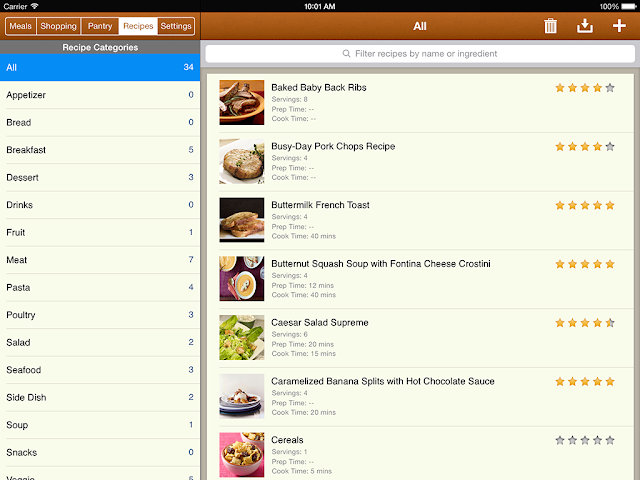 Enter Mealboard, a meal planning, shopping and recipe organization app for iPhone and iPad($2.99, available on the AppStore). MealBoard allows you to store and organize recipes which you can enter manually OR easily import from a handful of popular recipe sites, plan your week’s worth of meals (breakfast, lunch, dinner and snacks, even – but wow, you get a huge gold star from me if you are that organized!) AND it will make a shopping list for you based on the recipes you plan to use. Planning meals is pretty straighforward. 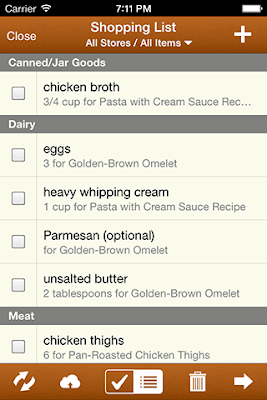 Simply tap the day you want to add a meal to bring up your recipes. Check the meal you would like to add and tap DONE. Once you have added all of your meals for your week, you can make your shopping list! This used to be a time-consuming task, combing through bookmarked recipes and going by memory, right? From your Menu Plan screen, you simply tap “Shopping” to access the shopping list. In order to make your list based on your current menu plan, you’ll need to sync (by tapping the sync button in the bottom left). 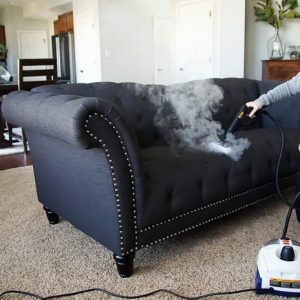 This will bring up a screen that gives you options to change the date range and servings you need, so it can give you the right quantities on your shopping list. You just made your shopping list for the week. In like, 2 seconds. Magic. 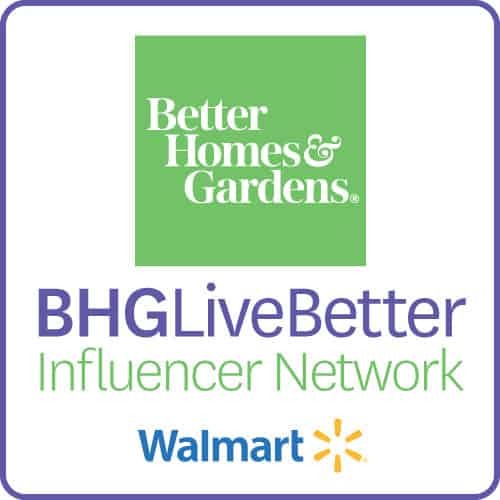 To make things even more organized, you can go in and catergorize items by store and aisle. You can even include prices, so you know what your grocery bill should look like before you even leave for the store. Of course, before you can add meals to your plan, before you can shop for the ingredients, you need to have the recipes! The app allows for import of recipes from a handful of the most popular websites like allrecipes.com, food.com and foodnetwork.com, which makes things quick and easy if you find the perfect recipe on one of those sites….. BUT! we all know some of the best recipes come from blogs, right? 😉 That’s where things get a little more labor intensive. You have two options for recipes that are not on a site that the Mealboard app currently supports for easy import or happen to be in a good ol’ fashioned cookbook off the shelf. 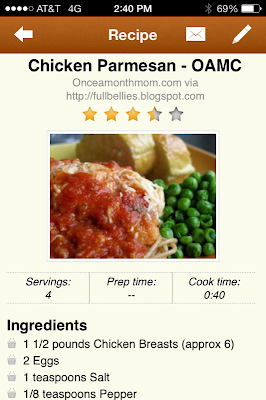 You can either enter the recipe, line by line into the app, copy/pasting the notes and directions (don’t forget that important “Recipe Source” line so you remember where you got the recipe AND give that person/place credit if you happen to share the recipe! )… OR you can use the web interface found at MealBoard.com. You can set up an account under “settings” and “Cloud Sync”. This login both syncs your recipes to the cloud (for backup and sharing between multiple devices) as well as allows you access to add and edit recipes via the web. 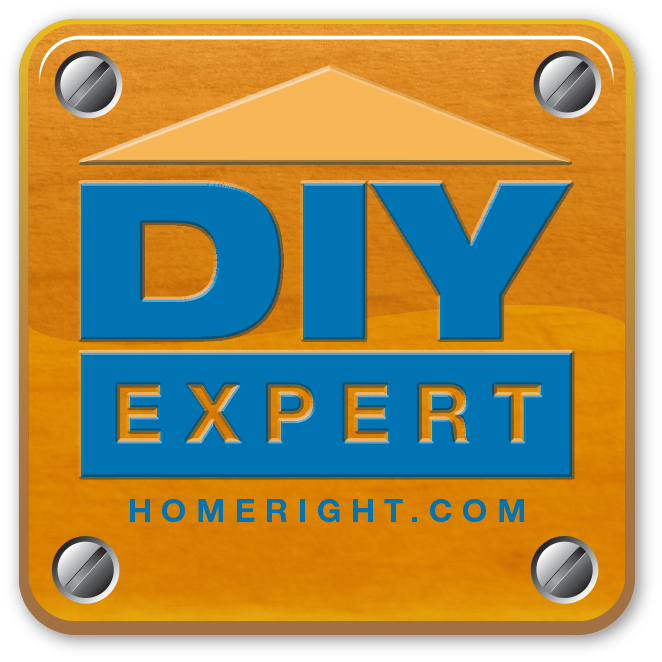 The web interface is fairly straightforward and mirrors the app in format, with the exception of the very useful and time saving “import from text” button. This makes adding recipes from blogs SO much quicker. The screenshots I’ve shown here are for the iPhone/iPod Touch, but the app also REALLY shines on the iPad. In addition to all of the features I mentioned above, the iPad version has a Month View for the Meal Plan and a nice, two-column view for recipes and grocery lists. 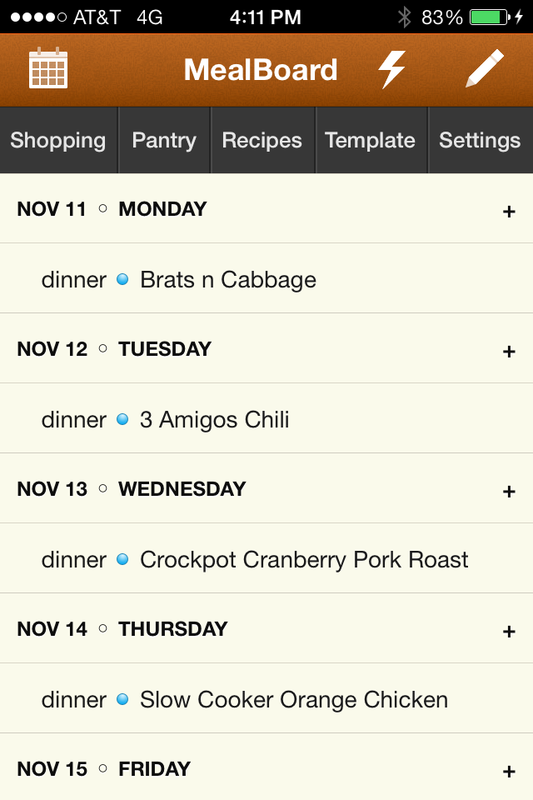 I really feel like this app has made my menu planning easier and streamlined my grocery shopping. 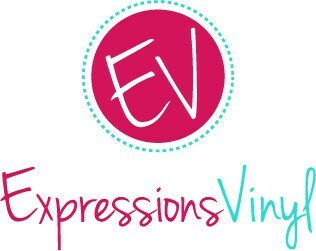 I use it on both my iPhone (for shopping and menu planning) and iPad (for adding recipes and of course cooking time!) on a daily basis. I’m thinking ahead (ha!) to Thanksgiving, adding my favorites in now to build our plan for the big day. 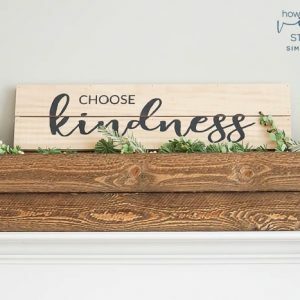 How great will it be to not have 3 cookbooks and piles of printed recipes floating around the kitchen, and the ineveitable last-minute panicked run to the grocery store? You&#39;ve convinced me Kelly, gonna give it a try! I haven&#39;t found &quot;THE&quot; app yet, but this one seems to check all the boxes? Thanks!! !